"Kentucky Winter Beauty" The Cardinal is always such a lovely bird but it is in the Winter Snow that he stands looks his best. They are so festive looking decked out in the bright red and black and the pointed crest makes them unique among all other red birds in the world. 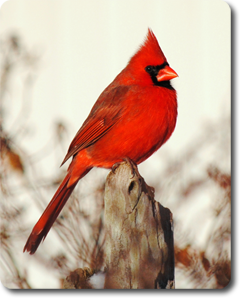 This stunning male Cardinal was captured on a fence post at my home in eastern Daviess County, Kentucky.